This Professional quality EC meters are reliable, pocket-sized instruments that will give you quick, highly accurate and stable EC readings of conductivity. It has been redesigned for increased strength, to better fit your hand and also offer a much larger LCD for easier viewing. Easy to calibrate and has given an IP57 waterproof rating -- splash proof keypad. 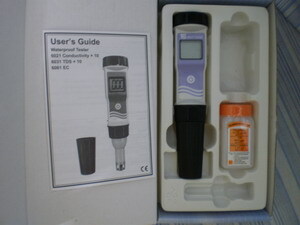 The Electrode can be replaced easily without buying the whole meter. Conductivity of a solution is highly temperature dependent. Automatic Temperature Compensation (ATC) assures that all readings are corrected to compensate for the effect of temperature. An LCD displays the digits clearly so they can be read at virtually any angle. All parts are made and manufactured in Taiwan. It also has a new feature wherein the mini-screwdriver can be stored inside the meter. Plus, the meter is housed with an impact resistant ABS body casing. Such a great device for hydroponics, aquaculture, irrigation system and freshwater systems to monitor the amount of nutrients, salts or impurities in the water. Measure and Monitor Conviniently, Efficiently and Accurately! Order Now!